Cause: Microblade needles are extra fine and can easily penetrate the skin deeper than needed, unintentionally reaching the lower part of the dermis layer of the skin. This can cause a warm or cool undertone to heal to an unwanted grayish color, particularly in a microblade procedure. Solution: To avoid grayish color results on people with a warm or cool undertone, use a warm brown color(s). For example, use a color that has a warm base such as #04 Attractive Warm Brown, which looks brown but does not have a strong red appearance, unless a color with a visible red is requested. 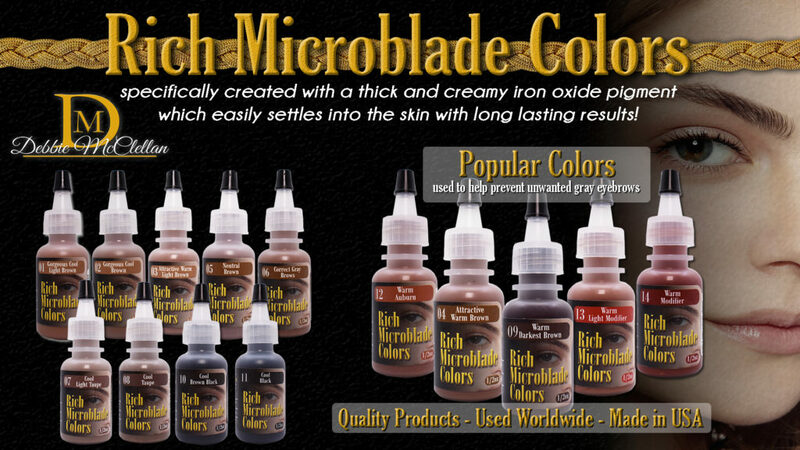 Another warm popular Rich Microblade Color to use is #09 Warm Darkest Brown. If a person has a predominantly yellow or olive undertone you may need to WARM UP THE COLOR MIXTURE EVEN MORE with colors such as #12 Auburn, #13 Warm Light Modifier or #14 Warm Modifier which can make a beautiful rich warm color.